One warm sunny afternoon of July of 2008 that I was sitting on my couch, I was thinking I really want to have a cat, as we grew up having cats in our yard. I saw these beautiful, fluffy, blue eyes cat at pet store but I didn't know anything about them. The only breed of cat that I knew at the time was persian cat! Although my husband didn't like keeping pet at home, I got into my car and eventually I ended up buying a pure breed ragdoll from petland and that is how I ended up having my cats. Kitty got born on March 2008, he was a baby when he got to our home, he is one of the loveliest creature on earth, calm, warm an/d friendly. He is registered with The International Cat Association (TICA) and he has five generation pedigree, you can view his documents here or send us a email requesting his documents. Juliet joined our home when she was just 8 weeks on thanksgiving of 2008 and she was and still is very playful and active, charming and beautiful. She is also TICA registered and has five generation pedigree. Well what can I say they fell in love as soon as they've met and still she recognized Kitty as her commander not me! You can view her document here . 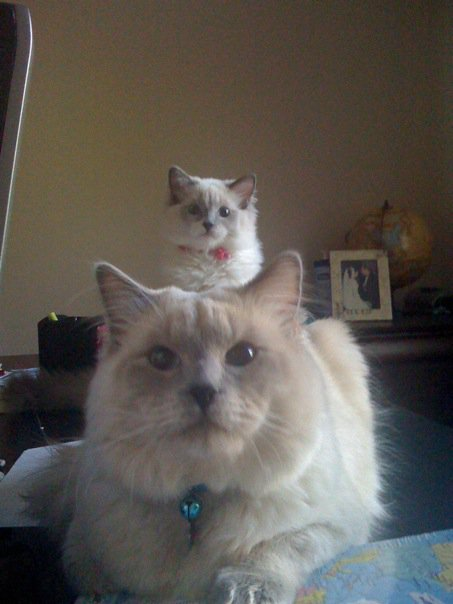 Like any other ragdoll, they are docile, mild-mannered and conenial, they are our companions at home. They are laid-back, sweet and playful but not overactive. They adapt to our home easily and get along with my children easily. They have soft, polite meows and have cute habits. Most of the time they are following each other and play together and they like to take the bath every month and love to be groomed and get attention. They are very well trained, as they know where to play, where to scratch, where to sleep and of course they are potty trained. Cats are clean in nature but these two always are real nice and clean.